It’s been a busy week for press releases from our clients. Shurtech Brands, owners of Duck brands which includes Duck® Tape, announced the launch last week of another DigitalDay designed and developed website: DuckProducs.com. The new Duck brands website, designed and developed by DigitalDay, went live Monday this week. This new Duck site combined four previously separate properties into one stronger, content-rich and content managed, online marketing presence. Like many companies, Duck brands developed separate websites over the years to support different marketing strategies. Not only did this cause maintenance headaches, it confused consumers and diluted the brand’s messaging. The old Duck Tape website, developed when the brand was owned by Henkel Corporation. To help the client keep service costs down, DigitalDay implemented Sitecore’s Content Management System. This powerful tool will allow the client to make routine updates, product changes and review and approve consumer-generated content through an easy to understand interface. So, without any further adieu, here’s the new release . . .
AVON, Ohio (December 16, 2009) – Whether you’re a crafter interested in sharing some creative duct tape ideas, a DIYer looking for help with blocking out pesky drafts or a teen searching for unique ways to earn much-needed scholarship dollars, www.duckbrand.com – the new online home of Duck brand products – can help with these solutions, and more! The site provides helpful tips and tricks for using various Duck brand products around the home, from Duck Tape® brand duct tape and weatherstripping to shelf liners, packaging tapes and more. In addition to accessing useful product solutions for both everyday and outlandish problems, visitors can submit their own ideas or comment on those submitted by others. For Duck Tape enthusiasts, the new www.duckbrand.com is also home to the popular Duck Tape Club (offering fun and quirky uses for Duck Tape), the Stuck at Prom® Scholarship Contest (challenging high school students to wear duct tape to prom for a chance to win scholarship money) and Ducktivities (providing duct tape crafting how-tos and an option for crafters to upload their own creations). Visitors are also encouraged to interact with the site through the Duck blog, which will provide seasonally relevant product information and other brand-related news; a discussion board for sharing experiences, new product ideas and craft inspirations; as well as social media integration with outlets such as Twitter, Facebook and YouTube. For more information, please visit www.duckbrand.com. Our client, Backgoundchecks.com, just published the following press release regarding the new website and logo we helped them develop. This project was more than just a branding and website redesign project. DigitalDay played a key role in the complete re-tooling and repositioning of the company’s marketing strategy. 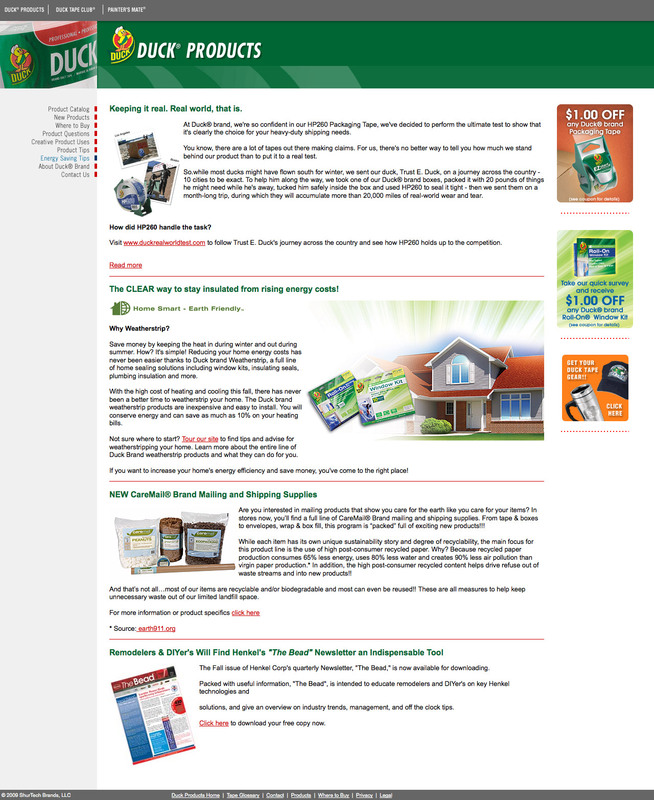 DigitalDay provided the strategy, branding, design and front-end templates for Backgroundchecks.com's new consumer website which launched December1, 2009. Working collaboratively with Backgroundchecks.com’s marketing and IT department, we developed a search-engine-rich market segmentation strategy, created the new brand identity, and designed an intuitive eCommerce interface. After the strategy, information architecture and design work, our technical team rolled up their sleeves to deliver the complete front-end of the site in Microsoft’s ASP.NET MVC compliant templates. The client’s IT department then integrated the templates into their system. Here’s the release . . .
DALLAS–(BUSINESS WIRE)– Dallas-based Backgroundchecks.com, a leading online background screening provider for Fortune 500 companies and provider of the #1 criminal convictions database in the industry, launched a newly redesigned consumer website that includes new consumer products services, and a new logo. The new site, which launched on Dec. 1, comes as part of a total brand revitalization designed to better serve consumers with background check needs. The new website includes an interactive learning center with in-depth FAQs for all products, a Crime 101 page, search tips and instructions for those who need help with online purchasing. The final portion of the revitalization comes in the form of a new company logo, designed to represent who BackgroundChecks.com brand and services.